The head of Anarchopanda, an unofficial mascot for Montreal protesters, was seized by authorities during a demonstration against municipal bylaw P6 on Friday night, during which 279 people were arrested. Anarchopanda's head was seized by authorities during a protest against municipal bylaw P-6 in downtown Montreal on Friday night. Anarchopanda became a popular icon during last year's Quebec student protests. Montreal police said his head was taken because of laws forbidding the wearing of masks during street demonstrations. Police spokesman Daniel Lacoursière said the mask "is considered to be an exhibit and could be used in court." The man under the costume, a philosophy professor at the Maisonneuve College, received two $637 fines after he was caught in a kettle — a police manoeuvre to control protesters. The fines were imposed because he wore a mask and took part in an illegal protest, police said. 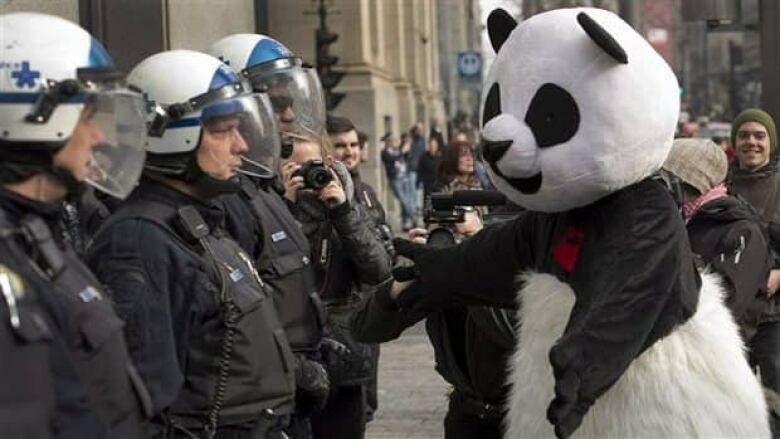 The man disguised as Anarchopanda had already received a fine for taking part in an illegal protest on March 22. This is the first time he was reprimanded for wearing a mask. A total of 279 people were arrested during the protest against by-law P-6, the guidelines imposed on protesters demonstrating in Montreal.